The Equality Act requires you to protect your employees from discrimination, harassment and victimisation. 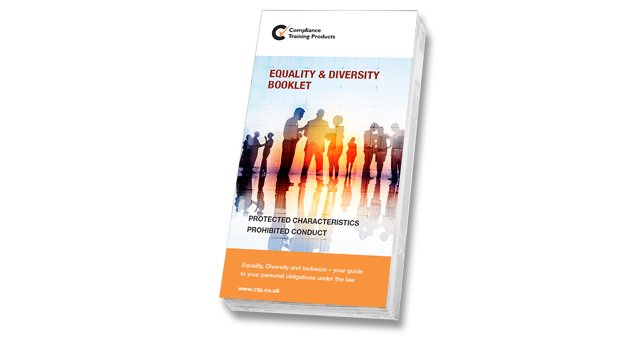 Send out the right message – Equality & Diversity Booklets offer a handy reminder for your staff – covering the nine ‘protected characteristics’ and the different forms of ‘prohibited conduct’. Looking beyond the important legal message, they also encourage staff to treat everyone with consideration and respect. Booklets contain a checklist for employees to sign, confirming they understand their personal responsibilities – and enabling you to show that appropriate information has been provided to every member of staff. Our e-learning course includes a separate recorded test module that enables your staff to show they’ve understood the importance of treating people fairly in the workplace. Covering a range of important compliance topics – these handy booklets offer a convenient and cost-effective way to make your staff aware of their responsibilities.